When Vancouverites want to get away from the depressing winter rain and clouds they invariably have to make a choice between either Mexico or Hawaii. Both guarantee sunshine and warmth with Mexico a little closer and less expensive, but everything's in Spanish. So when the dollar is good, and you want a holiday without complications, it's hard to beat Hawaii which almost seems like home. Having travelled around the world it was hard to believe we had never been there before but,we were determined to check it out and, the first thing to learn was that it consisted of a number of islands and we had to decide which ones we wanted to visit. 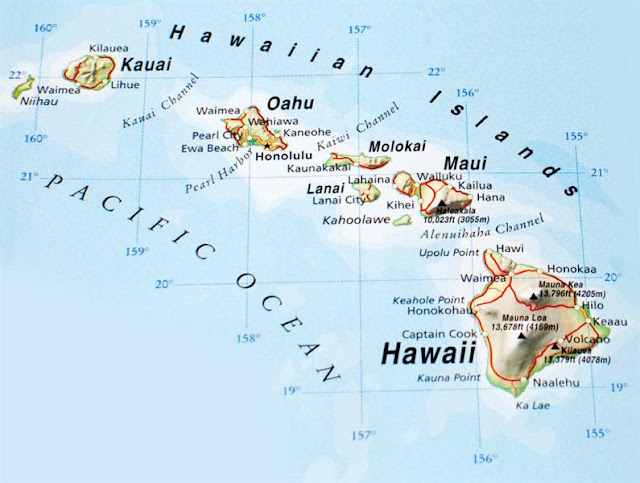 It seemed there were two distinct lifestyles being offered; the big city lights and action of Waikiki/Honolulu on the island of Oahu and the more laid back atmosphere of Maui, so we decide to check out both. First stop was Oahu where we were greeted at the airport and given a lei, the traditional flower necklace, to wear with an equally colourful Hawaiian shirt. Even the statues seemed to be wearing leis. Staying in the hotel zone, just off Waikiki Beach, everything was within walking distance, just like we are used to in Vancouver's west end. The temperature was perfect and the water very inviting but, before any swimming, boogie boarding, or attempts to surf, the first thing needed after walking around and getting oriented was nice lunch and some refreshments. It would be a recurrent theme throughout the holiday, along with the search for a bargain priced Mai Tai and the perfect fish taco. Duke's quickly became one of our favourite hangouts, along with the Shorebird, which were both strategically located along the beach. There were other pursuits of course like sitting on the beach with a good book and going for a daily swim, and we settled into a daily routine that combined a little exercise with some relaxation. 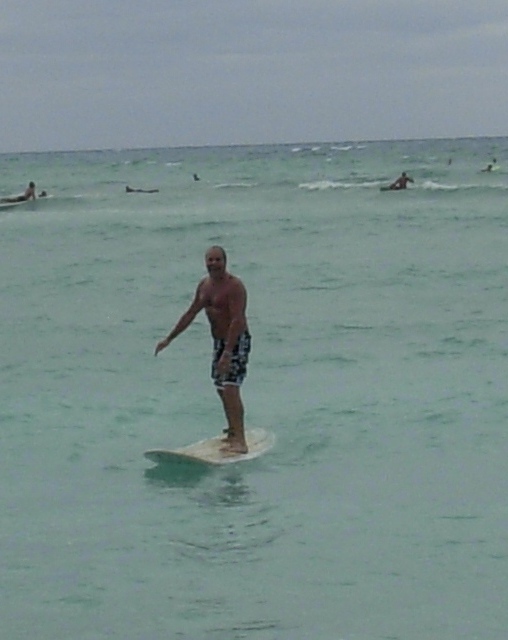 For me though the highlight of the Waikiki beach scene was finally getting up on a surfboard after an hour of trying. Even though I also tried the boogie board and stand up paddling it was catching a wave that really got me on top of the world, and each time after that it got a little easier. In addition to the surfing scene the streets are also filled with beautiful shops and expensive boutiques. How people can afford all these designer goods, and where they all come from is a mystery but, in spite of the glamour on luxury row, it was just as much fun to explore the parks, pose with the public art, and climb around the enormous banyan trees. Best of all it was free. Another place that was almost free was the stunning Hanauma Bay Nature Preserve Park where we spent a glorious day snorkelling with fish and turtles in the coral reef, soaking up the sunshine, and watching humpback whales breaching right in the bay itself. Just get there early if you want to beat the crowds and get a spot. A climb up Diamond Head provided a dramatic view of an ancient volcanic crater and an instructive lesson on how these islands were formed. It's a moderately challenging 1 km. goat track, interspersed with stairs and tunnels that eventually leads to a viewing platform on top of an old war bunker. It offers a stunning view of the surrounding area, including Waikiki itself and, once again, the sight of humpback whales cruising by oblivious to all the tourists. Wherever you go in Waikiki, Diamond Head is never far from view. In the park below there's a delightful Aquarium with its collection of indigenous reef fish and a pair of photogenic monk seals. Neighbouring Honolulu also has its share of attractions including museums, art galleries, and interesting architecture interspersed, as always, with magnificent trees. Staying in a condo/hotel overlooking the marina gave us a great view of all the early morning surfers, cruise ships coming into port, and the spectacular evening sunsets. It was also close to Magic Island Park and the Ala Moana beach, a naturally formed outdoor pool that was perfect for my daily swim. With picnic tables and plenty of shade trees, the park was an ideal place to spend the day soaking up the sun and watching other folks enjoying the beach scene. It was also the rally location for a variety of events like the Martin Luther King parade that featured the Buffalo Soldiers motorcycle club. Sometimes we would go for long walks and other times we would just put our feet up. With our reciprocal yacht club privileges we were also able to take advantage of the restaurant facilities at the Waikiki Yacht Club. It can be easy to forget the Hawaiian Islands are located in the middle of the Pacific Ocean, 2,400 nautical miles west of San Francisco and 4,000 miles east of Asia, until the weather or some other natural event stirs up the sea and big waves start rolling in. On the the north side of Oahu we had the privilege of watching 30-50 foot waves hitting the beaches of Sunset, Banzai, & Pupkea that had to be quickly closed off and the townspeople prepared for possible evacuation. We took refuge at a food truck in Pupukea where we could have a tasty meal and take pictures of the waves. After all the swimming, hiking, surfing, snorkelling, eating, drinking, and sun-tanning, it was time to move on. Maui was our next stop and here the scene was distinctly suburban with the need for a rented car to get around and, rather than a hotel, our stay would be in a rented condo where we could do our own cooking. The location on Sugar Beach was superb, with a colourful coral reef right on our beach that was home to a half dozen green turtles. Even more impressive was the view it offered of the migrating humpback whales continuously breaching and tail slapping out in the ocean. 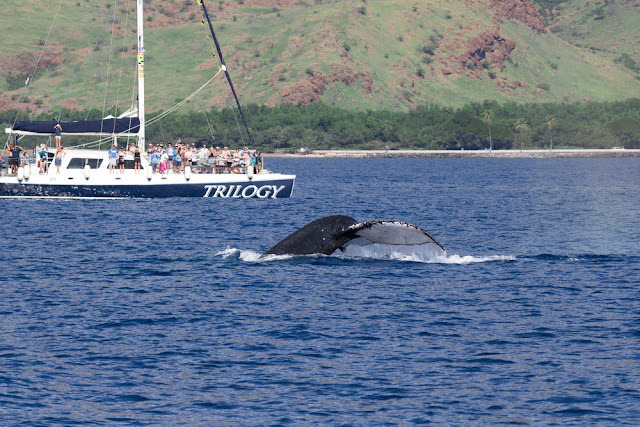 One of the first things we did was book a whale watching tours so we could get closer to these magnificent creatures, and throughout our stay we never got tired of watching them cavorting. 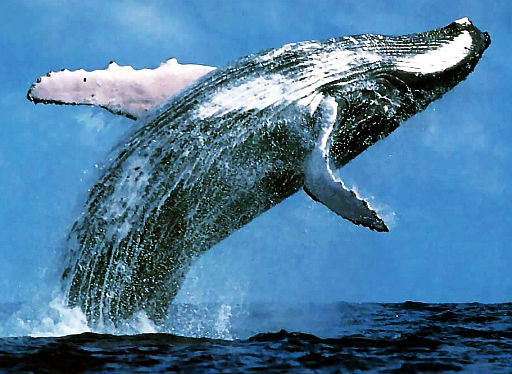 Hunted nearly to extinction, commercial whaling of humpbacks was finally banned worldwide in 1966. After that the population slowly but surely started to recover and, in the North Pacific, it's estimated there are now over 20,000 of them. Feeding only in summer months along the Alaska and British Columbia coastline, they migrate in winter to warmer waters to give birth and mate. While some go as far south as Baja, Mexico the majority spend the winter every year in Maui. With thousands of these beasts in the water, going through their courtship rituals and having babies, every boater has to keep a sharp eye out to avoid any collision. 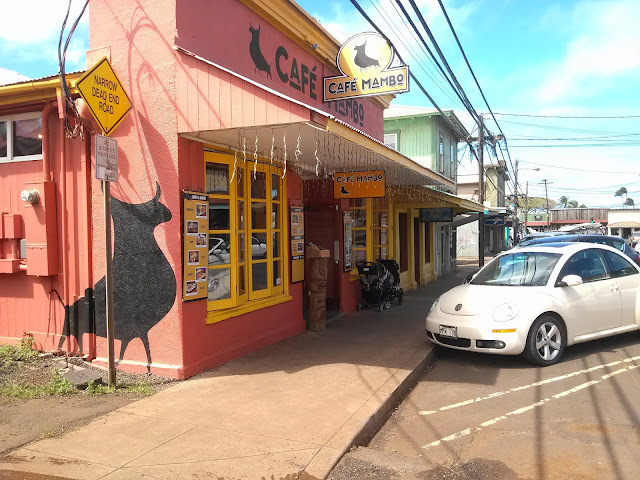 The old whaling town of La Haina is now a tourist stop filled with souvenir shops and restaurants that line the boardwalk, and it also boast the biggest and most fascinating banyan tree in Hawaii. Kihei itself is a very laid back place, with bars and restaurants far from the beaches that were crowded with families enjoying the warm waters, but it did have an interesting humpback sculpture. Of more interest was a place called La Peruse Bay, located at the end of the highway and a road that went through an ancient lava field. We would drive here in the early morning before dawn every day hoping to go for a swim with the dolphins which were known to frequent the area. For some reason the dolphins never showed up and I had to content myself with some impressive snorkelling instead. But on our last day a humpback whale arrived and I had a very exciting adventure with a most impressive swimming partner. The sunsets every night were spectacular and at the end of each day we would get out the conch shell so thoughtfully provided for each room and, along with a few other residents, blow on it as the sun quickly went down. On our last day we drove to the north coast of the island and marvelled at the stunning scenery and brave surfers. The town of Paia is a funky throwback to older era when the beach culture first evolved, but its traditions haven't disappeared, and a new generation, looking for a different lifestyle, is determined to carry them on. It was a great way to finish up a wonderful holiday and say aloha to Hawaii.